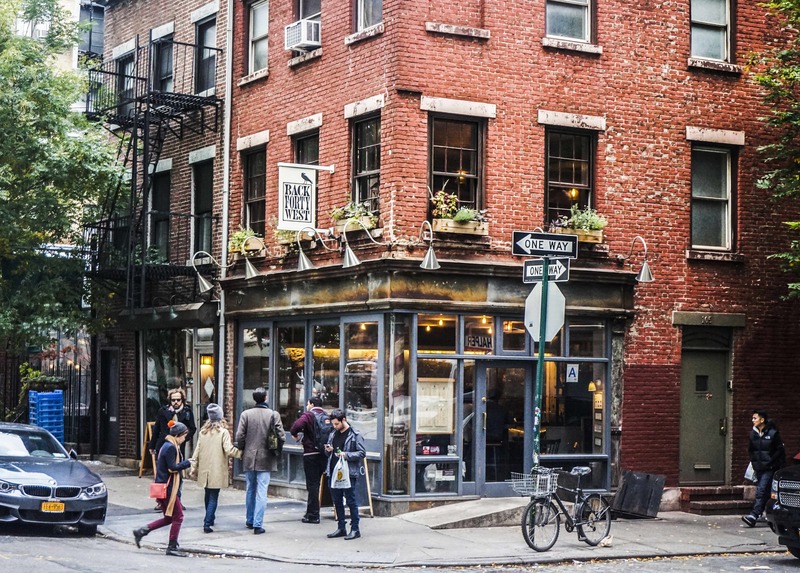 Office space in SoHo puts businesses in one of the most popular neighborhoods on the planet. Short for South of Houston Street, the upscale neighborhood is synonymous with style, luxury, art, and NYC culture. The area is best known for its cast-iron buildings, cobblestone streets, spacious lofts with large windows, and collection of boutique and chain fashion stores. 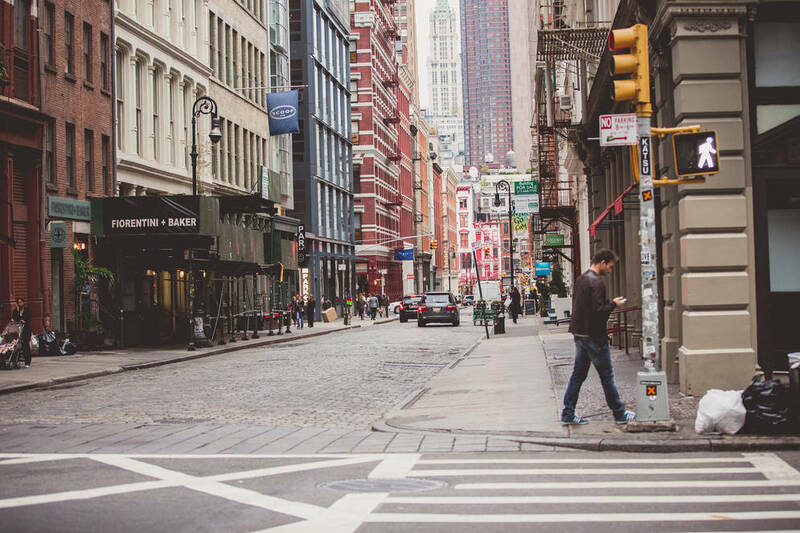 SoHo has a rich and varied history, from a manufacturing area to a hub for artists to now one of the most expensive and in-demand locations in Manhattan. The high demand for SoHo office space is largely due from the neighborhood’s prime location, access to subway lines, amenities for employees, and proximity to the city’s other major business districts. With nearly 5 million square feet of office space available for rent and another 300,000-plus under construction (as of July 2018), the neighborhood has options for businesses of all sizes. Based on SquareFoot’s New York City office space leasing data, the average asking rent for SoHo office space in a Class A building is slightly above $100 per square foot, among the highest of any NYC office space submarket. However, there is nearly 3 million square feet of Class B office space in SoHo that rents for a more affordable rate of $70 per square foot. 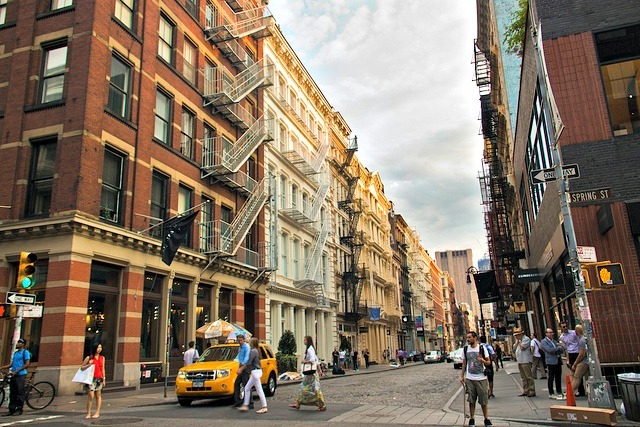 The vacancy rates for both Class A and Class B office space for rent in SoHo hover around 10%. SoHo has the world’s largest collection of cast-iron buildings, with memorable facades and fire escapes. Large warehouse windows allow for tons of natural light, and there’s plenty in the neighborhood for employees to enjoy. Notable tenants in SoHo include e-commerce, retail, technology, media, and financial services companies such as Warby Parker, Two Sigma Investments, DigitalOcean, FourSquare, Harry’s, Thrive Capital, Group Nine Media, Accenture, Wieden + Kennedy, and WeWork Labs. Hinge: The popular dating app moved into a 5,000 square foot space on LaGuardia Place. Point One Percent: The marketing agency moved their 15-person team to a third-floor office on Broadway. Instacart: Now valued at $4.5B after its most recent $150M round of funding, the grocery delivery startup previous worked with SquareFoot to find office space at 580 Broadway. SoHo’s history dates back to when Lower Manhattan was a Dutch settlement known as New Amsterdam. The land that is now SoHo office space was the first free black settlement on the island, given as farmland to freed slaves of the Dutch West Indies Company. By the mid 19th Century, large commercial shops had opened in the area, including Tiffany & Company and Lord & Taylor. During this time period, a number of the neighborhood’s iconic cast iron buildings were built. Shortly after the Civil War, SoHo became a hub for textiles, manufacturing, and dry goods distribution. However, following World War II, many manufacturers moved south, leaving SoHo warehouses and factories empty. As these businesses left the area, SoHo fell into decline. In the 1950’s, artists began moving into the loft-style buildings, taking advantage of cheap rent, large, open spaces, and an abundance of natural light. This is the beginning of the culture and style of what we now associate with SoHo. In 1963, city planner Chester Rapkin created the SoHo moniker. This was around the same time a plan to build a highway connecting the Williamsburg Bridge and Holland Tunnel was shot down, saving the neighborhood. By the 1970’s, there were thousands of artists living in the neighborhood, and the decades have seen the likes of Andy Warhol, Philip Glass, Jean-Michel Basquiat, Twyla Tharp, and David Bowie all reside in SoHo at one time or another. Changes in zoning laws over the past 30 years have drawn in more affluent residents and raised both residential and commercial real estate prices. However, more than 600 buildings are marked are designated and protected by the New York City Landmarks Preservation Commission. In addition to being an abbreviation of South of Houston, SoHo’s name is a reference to Soho in London’s West End. SoHo’s naming convention became the model for renaming emerging and re-purposed neighborhoods throughout the city, such as Tribeca, DUMBO, NoHo, Nolita, and NoMad. The naming convention is also used across the country to rebrand commercial and residential redevelopment zones. For food recommendations, be sure to check out our SoHo Lunch Guide. SoHo is easily accessible by train. The 1, 6, A, C, E, N, R, J, and Z trains pass through the neighborhood, as well as the PATH train, making SoHo easily accessible from Brooklyn, Queens, and nearby suburbs. Additionally, many regional buses such as MegaBus and Boltbus have stops along 6th Avenue. Because of cobblestone streets and the flood of tourists, roads are usually congested, making for a less pleasant bike ride than other parts of the city. For less traffic, cyclists can take the Hudson River Greenway. Commuters using CitiBike can dock at any of the near-dozen stations in the neighborhood, some of which hold as many as 45 bikes. Employees based closer to the popular shopping streets may have a more difficult time finding an opening to dock their bike, especially during the warmer weather months. SoHo, like the rest of Manhattan, suffers from debilitating traffic, so we recommend alternative means of transportation whenever possible. However, SoHo is close to the Holland Tunnel, allowing for relatively quick access to New Jersey, Newark Airport, I78, and I95. Employees who need to travel for work can take the PATH train to Newark, or the A train to JFK Airport. Nearby districts include Hudson Square and Chinatown.